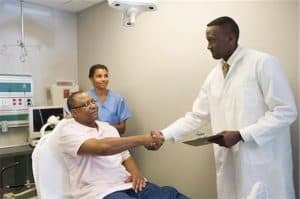 As health-reform continues to take effect over the next several years (in one way or the other), millions of newly insured Americans will gain access to a regular doctor. 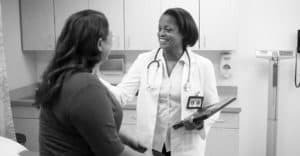 They will soon learn what others already know: Getting the best care from your doctor requires navigating a complex relationship within the precious few minutes during a typical office visit. One thing that all of us should understand is the enormous demands on your doctor’s time. Every day, people just like you are planning to go see the same doctor that you are, and expecting to be treated like they are her/his most important patient. Do you ever feel like your doctor isn’t really listening? Or that he/she doesn’t review notes when meeting with you. Or maybe you are wondering what even goes into the notes? Between 40 percent to 80 percent of medical information provided by care providers is forgotten immediately, and the greater the amount of information shared the greater the percentage forgotten. That’s huge, and that lack of retention has negative impacts on patient understanding, adherence and outcomes. People best take in information presented in two ways: verbally and visually. Studies have found that when medical instruction was provided verbally, only 14 percent of the information was retained, versus 80 percent when a visual accompanied with text was provided. Review what you think you heard during the last appointment. Give your doctor a brief summary of where you are to date. It can save a lot of time and frustration for you and your doctor. You can say something like: “I just want to touch base on where we are on _____________. During our last appointment, you said _____________ and as a result I _________________. Are you still comfortable with that?” This approach has a couple of benefits. The first, of course, is that you help assure you are going to get accurate and appropriate recommendation. The second, less obvious benefit, is that give your doctor an out if he/she has forgotten what was said. Stated this way, you are not saying directly that your doctor is in error, but that there may have been a miscommunication. This isn’t about “sucking up” to your doctor, but it avoids putting your doctor on the defensive, and promotes the type of teamwork that should exist in a doctor/patient relationship. And keep in mind that the misunderstanding could have been on your end, especially if your doctor was moving faster than usual that day and didn’t explain things thoroughly. Express your concerns if you feel your healthcare is at risk in any way. I am not intending to imply that you shouldn’t advocate for yourself. If your doctor’s contradictions or forgetfulness alarms you in any way, e.g. if you are absently-mindedly prescribed what you know to be a medication you should not be taking, then you have a right to make your doctor aware of your concern. Take a direct approach: “I need to express a concern here. I know you have a lot of patients to see. But I am (allergic to, have had no results before from, etc.) that medication. We’ve talked about it before, and it should be in my file. I get worried when I feel like you aren’t giving me your full attention.” You’re helping your doctor to do his/her job better. Don’t hesitate to take the lead to make sure you’re on the same page. Helping your doctor to do his/her job benefits both of you.